Thank you for visiting Victoria Street Chiropractic online. 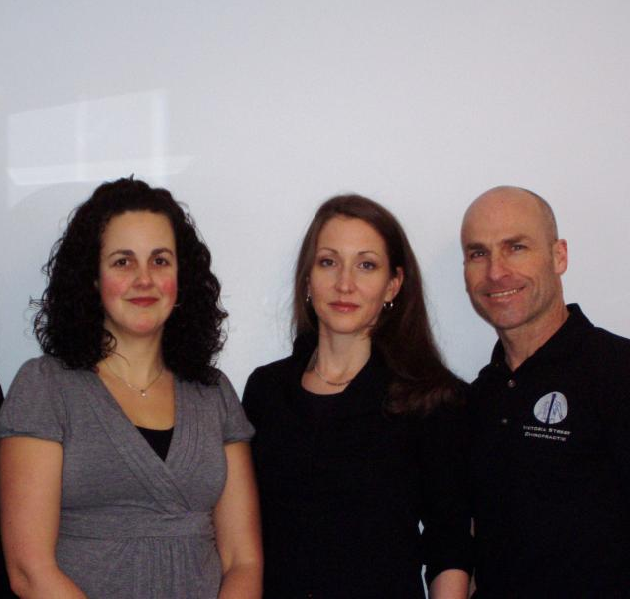 Dr. Elvyn Gropp, Dr. Heidi Mathewson, Christan Westcott, RMT, & Melis Tosunoglu, RMT look forward to meeting with you in person. Learn about chiropractic by clicking on the chiropractic tab to the left of your screen or by clicking on the link. The diagnosis page provides information about what you can expect during your chiropractic examination. The treatment page outlines the care offered at the clinic and about us provides information about the clinic hours and a complete list of the services offered. Please check the box to the right for information, upcoming seminars and events. We hope that you find this site informative and encourage you to call with any questions you may have. Our clinic is committed to providing accessible and equitable service to each and everyone of our diverse and valued patients. We now offer the option of booking appointments on-line. You may book your chiropractic visit or your massage therapy session and even choose which practitioner you would like to book with. Please visit the ﻿on-line booking page for more information.